Get those fingers resurrected. The terrible KUNG FU HIP HOP was elevated into “so bad it’s good” territory with its infamously bad English subtitles. Sadly, the screening the official LoveHKFilm movie group (which sometimes go by other names like “The Gang of Film” or “People Who Watch Movies so You Don’t Have To”) attended included no English subtitles. Fortunately for the Chinese-impaired, the story’s plot is so simple that they didn’t need to know the dialogue to understand most of the plot. Sadly, for the rest of us, we had to sit through the dialogue. 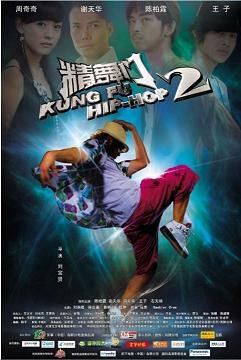 A sequel in name, KUNG FU HIP HOP 2 comes with a brand-new cast led by Wilson Chen, Zhou Qiqi (who shows off quite a bit of, ahem…talent in the film), Prince (of Taiwanese boy group Lollipop) and Michael “Laughing Gor” Tse (former backup dancer and the winner of a television celebrity dancing contest). For fans of any of these actors, the film is practically review-proof. This is especially the case for Prince (no relation to the artist who formerly goes by that name), who seems to believe that the harder he squints his eyes, the better his acting is. The Prince fans that made up most of the film’s audience thought that it was charming to the max, which would make me the old geezer. In addition to the film’s weak acting, directing, and editing, director Lau also makes the misguided decision to hire real dancers to go up against Chen, Prince, and his dance crew. As the actors stay in the back while the other dancers do the real dancing, the opponents - in more case than one - end up performing even better than the main stars and still manage to lose the competition. They must’ve gotten the judges from FIFA. Nevertheless, the dancing is just about the only redeemable thing left in this film, as even the unintentionally hilarious humor of the first film is gone. I probably should go easier on it, since it’s just disposable, teen-oriented time filler. Then again, any teen should have better things to fill their time than this. Actually, I take back about the film having only one redeemable thing - the film features Wilson Chen doing parkour. Price of admission: earned. As I mentioned on my Twitter, Derek Yee said that this isn’t really his film, but a film for the commercial audiences of China. Audience elsewhere might be wondering why a film so cerebral and so talky would ever be commercial, but the film has now topped Chinese box office for two weeks in a row, showing that Yee and his two co-writers ended up being quite successful. A continuation of DOUBLE TAP (which Yee produced), TRIPLE TAP deals with similar themes about human nature and the power of the gun, except it does so in a far more talky, didactic manner than the first film. DOUBLE TAP was a tense, violent action film that went a little far in portraying its psychologically abnormal villain (played by an over-the-top Leslie Cheung). TRIPLE TAP is a film that pretends to be clever by hiding information from its audiences, and ends up frustrating that very same audience by not going anywhere for a very long time. Its characters are shallow, unconvincing, and worst of all, bland. Louis Koo the financial genius is boring, even when he hits the point of insanity; Daniel Wu has little charisma as the righteous cop; the return of the Alex Fong character from DOUBLE TAP and ONE NITE IN MONGKOK was good, but even he’s forced to indulge in Yee’s silly depiction of crime solving reminiscent of Simon Yam the Jedi Cop in BLACK RANSOM. Running a full two hours, Yee stretches the story to the point of boredom without much to get its audience to its inevitable ending. For a film by any other filmmaker, this is a failure of a film. For a Derek Yee, it’s a betrayal against audiences outside China. There may not be a billion of us, but we pay to see your movie, too. The problem is he wants you to do it while watching this. The worse Chinese (intentional) comedy since HERE COMES FORTUNE is an embarrassing affair for everyone involved, and the fault all go to director Lee Lik-Chi and its producer Charles Heung. 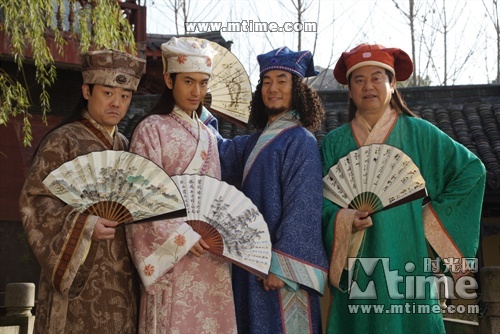 The prequel, which follows the adventures of Tang Bofu (played in the original by Stephen Chow, who we now know should take credit for the first film’s success) before he became one of the four famous scholars, rides on the fact that the first film was funny by recycling jokes that no longer work, especially when the actors from the first film are now 15 years older. All of it is exhausting to watch, and like a clown hopping all over the place to get you to laugh to no avail, it’s exhausting to watch. It’s hard to point the finger at the actors, though, since many of the actors from the first film and various cameos are just people looking for a payday and did what they were told to do. Star Huang Xiaoming tries his best to do comedy, but he’s obviously in no position to be in a HK-style mo lei tau comedy. Zhang Jingchu, who has been sharing promotional efforts between AFTERSHOCK and this film, is so good here that the only way she could’ve pulled off this performance is if she pretended that she was in a much better movie. There have been reports that Lee Lik-Chi was kicked out of the editing room because he wanted to make the film more of a romantic tragedy than a mo lei tau comedy. Sorry, buddy, the best decision you or anyone would’ve made is to have not made this movie at all. While Boss Kozo takes a much-needed/deserved break, I will work hard to try and fill that void with news and other content for this blog. First of all, while East Screen/West Screen head man Paul Fox is off to vacation in Florida, he worked hard and uploaded the first of two short blu-ray episodes we recorded before he left. - It’s box office time! We start off in Japan, where, as expected, BAYSIDE SHAKEDOWN 3 took the top spot in the audience admissions ranking. According to Oricon, the film made 972 million yen in its first two days from 477 screens, with 707,000 admissions. Toho is sure the film will break the 10 billion yen mark, and the question is now how close it will do to its predecessor, which still holds the record for the highest-grossing Japanese live-action film ever at roughly 17 billion yen. Amazingly, Tetsuya Nakashima’s CONFESSIONS is still holding up at second place, beating the debut of Luc Besson’s THE EXTRAORDINARY ADVENTURES OF ADEL BLANC-SEC. Meanwhile, Shunya Ito’s 300 MILLION (or LOST CRIMES) mustered a 10th place debut. More when further analysis comes out. - In South Korea, SHREK and KNIGHT AND DAY rule the charts, while third to fifth places are taken up by Korean films. The KOFIC chart here is missing the names, but they are: 3) 71-INTO THE FIRE, 4) MAN OF VENDETTA, and 5) THE SERVANT. - As Ryan of the Hong Kong Film blog reports, SHREK FOREVER AFTER dominated the weekend box office in Hong Kong. Thanks to inflated 3D prices and the extra takings from the two IMAX screens, the film has already made HK$12 million after opening on July 1st. TWILIGHT: ECLIPSE opened big and remained strong, despite SHREK. After five days, it has made HK$8.34 million. With much of its target audience out of school, expect fairly strong showing during the week. This will give distributor Golden Scene (who also has a minor hit with BREAK UP CLUB already) something to celebrate about, as NEW MOON actually grossed less than the first film. ECLIPSE is almost certain to do better than NEW MOON, but the question is whether it’ll match or beat the HK$18 million gross of the first film. Meanwhile, the competition didn’t help the performance of Derek Yee’s TRIPLE TAP, which made only HK$3.74 million over 4 days. Word-of-mouth will determine whether it’ll go past HK$10 million, and I don’t predict it will. Again, a more thorough analysis will come when hkfilmart.com or box office mojo updates its numbers. - There are two news items today about Feng Xiaogang’s AFTERSHOCK: One on Film Business Asia about it in the context of its distribution, and one by the Associated Press (carried by the Hollywood Reporter) about the film itself. Cynic mode: Feng has been pushing this film hard on how it has made the audience cried, and the cast has been doing the same about their own reaction to the film. These are part of contradicting message Feng has been putting out. At times, he throws out ridiculous box office predictions like 500 million RMB and how much he cares about how the film does at the box office. At other times, he talks about how the film isn’t an entertainment film, and how meaningful it is to have the families of the dead to be in the film. To me, I’m just hearing a director who’s flip-flopping to say what people wants to hear, and he’ll say whatever’s needed to sell the film. The most shameful (and perhaps unintentionally the smartest) of the publicity effort is when Feng and the cast continued to have its big trailer reveal publicity event on the same day of the Qinghai Earthquake. This is, however sobering the film is, a commercial blockbuster, from its big-budget special effects to the gimmick of being converted to IMAX. Feng isn’t going to put his film in the format if he knows he doesn’t have something to offer for it. At the same time, he knows the pushing the big budget spectacle isn’t going to help his cause, considering what his film is about, hence the calculated effort to play both sides. Again, it’s smart on Feng’s part (and have been told that this isn’t the first time he’s used calculated publicity effort), but from my cynical point of view, it’s also quite shameless. - Yoshimoto Kogyo, a huge talent agency in Japanese entertainment known for its arsenal of comedians (including actor/director Hitoshi Matsumoto) has formed a joint venture with the Shanghai Media Group to produce and distribute programs for China. - Earlier in the day, I posted a link to a Chinese new report with the new trailer for the Benny Chan sci-fi action film CITY UNDER SIEGE. Thanks to wildcinema’s Twitter, you can now check out a Youtube version of it, or if you have Facebook, there’s even an English-subtitled version. The Golden Rock celebrates America’s independence with a bunch of news from Asia! - The controversial documentary THE COVE opened yesterday in Japan. Japan Times reports that police security was on scene at the theaters, and Nikkan Sports reports that the Directors Guild of Japan has put out a statement firmly opposing any move by the protesters to prevent the film being shown. You can agree or disagree with the film’s agendas, but you can’t stop the open screening of any films in a society with free speech. - Speaking of lack of free speech, the Chinese government news agency Xinhua is launching their own English-language 24-hour news channel to give “a Chinese perspective to global audiences”. Propaganda goes international! - Korean hit war film 71: INTO THE FIRE is a hit in Korea, and now it’s heading to American cinemas. - It’s reviews time! Japan Times’ Mark Schilling reviews director Shunya Ito’s LOST CRIME, and Film Business Asia’s Derek Elley reviews the Chinese desert comedy WELCOME TO SHAMATOWN. - For those that didn’t like Derek Yee’s TRIPLE TAP, the co-writer/director explains that even he can’t believe that the film is his. “This is just a commercial film. I hope the audience can easily understand it”. Now it makes sense, except the problem with the film is that IT’S TOO FLAT. - The Ryuganji blog translate excerpts from an upcoming book about Takeshi Kitano, and he has plenty to say about Japanese society. - We here at Lovehkfilm loves the BAYSIDE SHAKEDOWN franchise, and its third installment opened this past weekend in Japan, and star Yuji Oda has promised that if the film makes over 10 billion yen, he’ll work hard towards doing a 4th film. - For those in Tokyo, rare color footage of early 1950s Japan shot by an American soldier will be screened in the Edo-Tokyo Museum in August. - K-pop fans: Artists of the major talent agency SM Entertainment such as Girls’ Generation, Super Junior, and BoA will be going on a world tour. Oh, and TVXQ will be there, too……………………….just kidding, they’re not done suing yet. - Last, but definitely not least, Korean actor Park Yong-Ha, known for his roles in WINTER SONATA and the film THE SCAM (which I reviewed) has passed away in an apparent suicide. The media has been covering which big stars are grieving for him, but I don’t think I need to join that party to say that the actor will certainly be missed.